There’s only about a month left until the new season of Westworld begins on HBO, and with that comes a slew of publicity as the pay-cable behemoth releases more teasers and images for the upcoming season. Ergo, it’s time to examine the newest batch of promo shots that was unveiled today, and proceed to read way too much into them. Here’s returning cast member Talulah Riley, whom you may remember from last season as the host who initially welcomed William to the park, but then was later seen in the park, revealing herself as one of the followers of Wyatt, the cult leader who supposedly convinced Teddy (James Marsden) to murder an entire town with him. Now, she’s dressed in what looks like much more contemporary garb; perhaps she’s trying to pass herself off as a guest? That could suggest some duplicitous intrigue between hosts and humans. 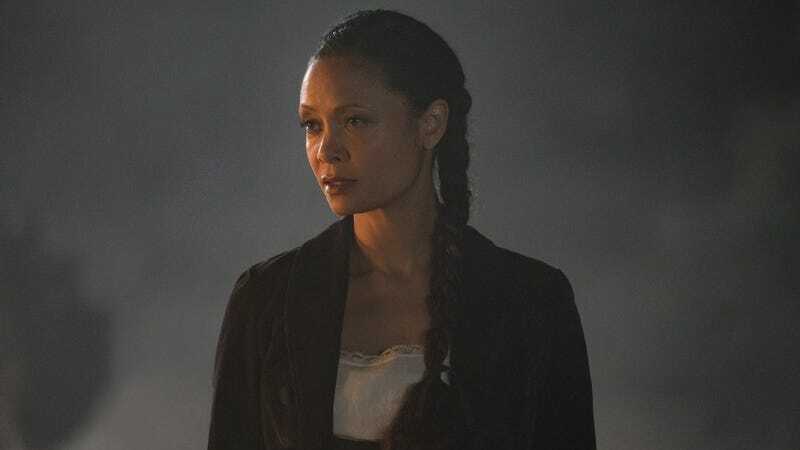 Thandie Newton’s scheming Maeve Millay is back as well, last seen choosing not to leave the park even after all that effort and bloodshed, possibly because of memories of a daughter. Here, she’s looking very much like herself, albeit no longer in the clothes she wore when running the brothel. She’s likely planning to re-enter the park in order to find a certain young host, which would indeed necessitate some more utilitarian clothing. Here’s the Man In Black, whom we now know to be William, all grown up and having given himself over completely to the game. He’s standing amongst dead bodies—whether human or host, we don’t know—and looking full of purpose. Maybe his hat is special? Actually, this is pretty much par for the course for him. Let’s move on. Next up are Dolores (Evan Rachel Wood) and Teddy, riding together at what appears to be close to sunset. Dolores ended the first season by putting a bullet in the back of the head of park founder Robert Ford. Teddy was told he’d soon help Wyatt again, but wasn’t ready yet. The two had a strange sometimes-love (originally programmed into them) during season one, so it looks as though their on-again-off-again natures might be on again now. In fact, let’s just say they’re getting married. That sounds nice and non-murderous. Hi, Bernard (Jeffrey Wright)! You were a park designer but also a host, and occasionally had the consciousness of forgotten park co-founder Arnold. During the final moments last season you looked on impassively as Dolores starting executing guests. Now Charlotte Hale (Tessa Thompson), on the other hand, is ostensibly human, someone who arrived last season to help facilitate Ford’s removal from power. The two of them together could mean any number of things, but let’s mostly assume it means Charlotte wants to live, and will do what it takes to ensure she stays that way. That is a very fancy-looking gun Maeve is holding, and head of the Narrative Department Lee Sizemore (Simon Quarterman) is looking a little less cocky than he was for most of last season. It’s possible his facility with storytelling is going to come in handy for the hosts who want to figure out what to do now that the park might be falling into their hands. After all, it was those stories that gave them a sense of identity in the first place; maybe Lee can help them evolve. Or maybe he’s toast and just doesn’t know it yet. Regardless, we’ll continue to ponder all these things until the show returns on April 22. Maybe there are aliens, too? Let’s just assume there are.